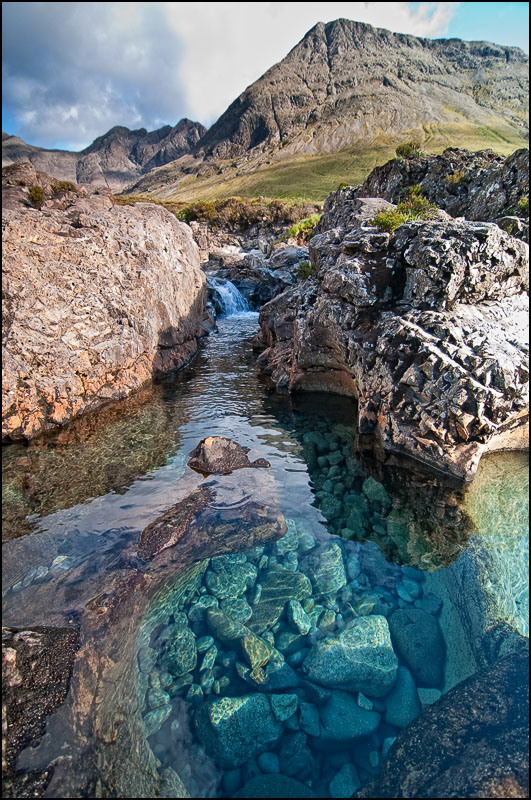 Fairy Pools, an another mystical place in Isle of Skye, it lies at the foot of black cuillins near Glenbrittle.It’s a pool of crystal blue water on the river brittle. As the name suggest this place is to be believed a pool of fairies. I have not seen any during my visit, but place itself is so magical that it will make you wonder and may be believe that after all fairy must have lived here. Many people around the world visit this famous pool to experience wild swimming and stunning landscape around. Me and my husband also visited Fairypool on a summer evening in June, it was partly cloudy and sunny weather, I was sure that I am not finishing this holiday without visiting this pool. 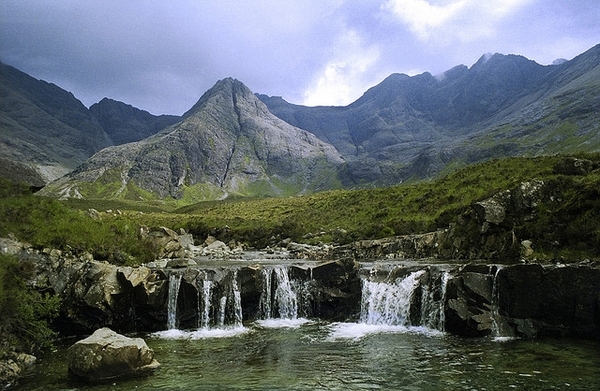 How to get there- The nearest village to the Fairy Pools is Carbost on the West of Skye, the start of the walk is on the road to Glenbrittle. 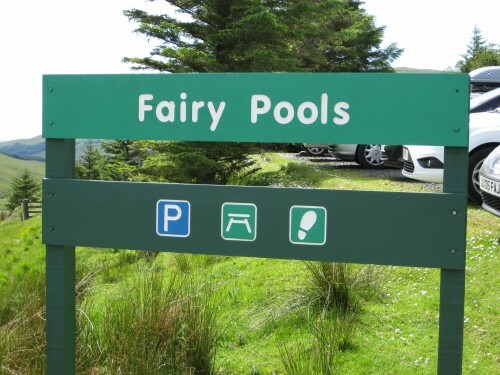 You will notice a sign board for Fairy Pools on the way, and there is a free car park as well. Weather- It rains almost all the year around in Isle of Skye.If you are the lucky one you may choose to visit this place on a dry day. Do not forget water will be icy cold, so you might want to carry a swim suit with you. 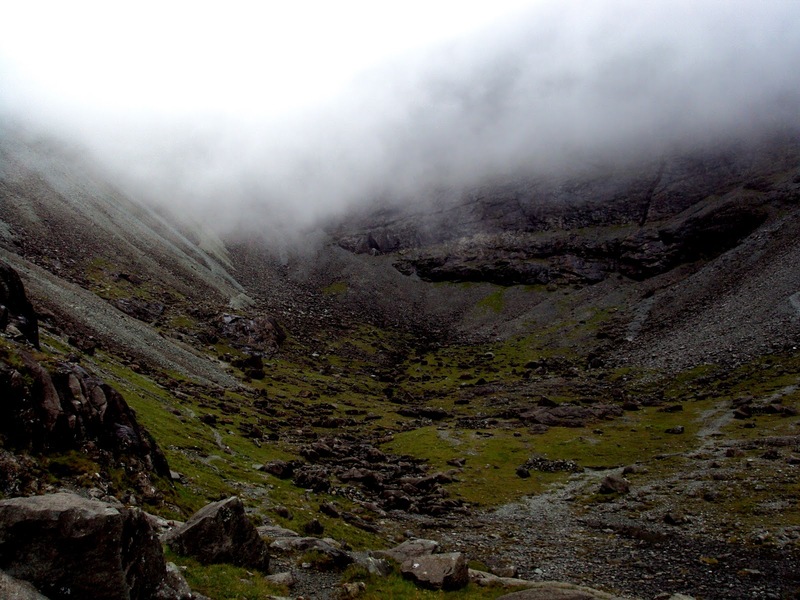 From the carpark, you will cross the road to opposite side with impressive views out towards the Black Cuillins, the source of the River Brittle. 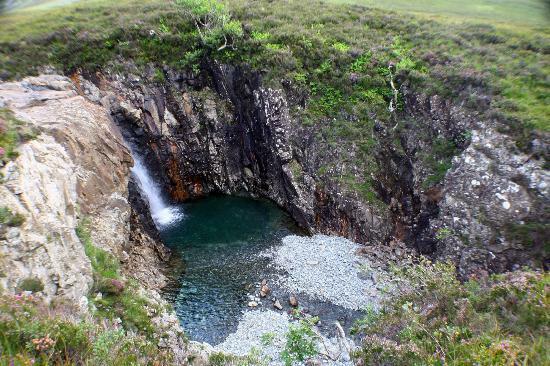 Your walk to fairy pool will start from the point, short walk to the first pools follows a gravel path that is in good condition most of the way, but does involve river crossings over stepping stones. It takes about 20 minutes to get the first and largest waterfall that marks the start of the pools. You can explore the pool in your own time as there are several of them some are very deep, some are shallow. Me and my husband took dip in couple of pools, but as water was cold and it was getting dark and misty we head back to car park after spending a good hour over there. Sharing some of the pictures. Thank you Chitra, Glad you enjoyed it. Thank you so much dear. Oh please do visit it, you will fall in love with the place. You would not feel like leaving it. The photos are excellent. I am in awe. Thank you MM. Lovely to see your comment, you stopped by after a long time 🙂 Glad you liked it. Thank you so much Shru. Thank you so much Kamila. Glad you liked it. Wow..amazing place and great photos! Truly beautiful scenery! Beautiful photos! The water looks amazing! Whenever I read anyones comment on Isle of Skye posts, it just makes me happy that even my readers feels the same way. Please do visit, it is a different island in this world. I am in love. I’ve been to Scotland recently, and it made me want to do a road trip over there. Driving in the highlands, visiting sky and so on ! Maybe next summer ! 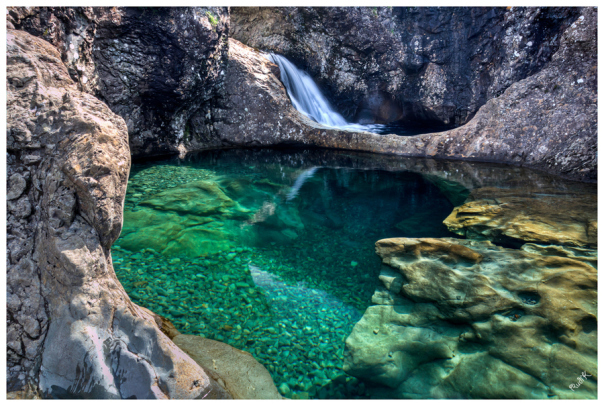 yep… they do look like fairy pools !!! Stunning pics! The Isle of Skye is among my top 5 favourite destinations. Cant wait to go back! Thank you very much Alex. That is indeed an encouraging and lovely comment. I have been away from blogging over the last few weeks, coming back to such wonderful comments does definitely brighten you up. And as you Said Isle of Skye is a breathtaking place, I could not agree more on that 🙂 I am looking forward to my second visit to this beautiful world in the next year. You seem like a bit of a blog pro to me. I’m completely new to it, apart from hassling my friends to follow me can you recommend me ways to get more followers? P.S. Make the most of the Scottish food when you go back there. It’s so fresh, hearty and healthy! Awww Alex. Sorry for getting back late, I have been unwell and was off from internet world for a while. I really appreciate your comment, brings a smile on my face. I am not a pro yet, but I try to write about every small trip I make. You try to write more often too. If you like someone’s else blog post, try to leave a comment – it makes you visible. I hope you plan it soon. And when you are there or while planning, do not hesitate to contact me. I will be more then happy to help you. 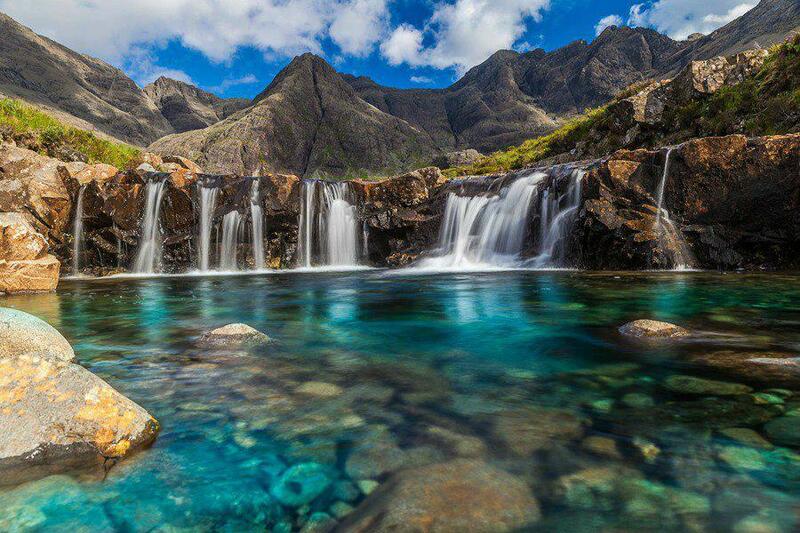 Pingback: Beautiful Fairy Pools In Scotlant | Mobile Popz!